Jakarta Indonesian Broadcasting Commission (KPID) visited ANTV office in Kuningan, South Jakarta.
" Television station who aired in Jakarta shouldn't regard local content as trivial"
Jakarta KPID wants all television stations, including ANTV to consistent in broadcasting local content of Jakarta in their program. "Television station who aired in Jakarta shouldn't regard local content as trivial," mentioned Rizky Wahyuni, Deputy Head of Jakarta KPID, Monday (5/22). She affirmed, local content in television program must be obeyed in each broadcasting agencies, both television and radio. "Local content should be aired 10 percent from total program in Network Broadcasting System," he explained. 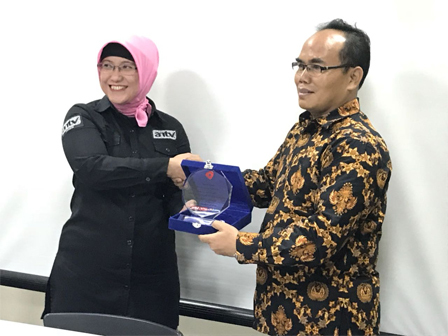 In the same place, Jakarta KPID Head, Kawiyan said, there are many local contents that can be explored from Jakarta communities, particularly Betawi culture. "Egalitarian Betawi language is one of many local content examples that can add more varieties of television and radio programs," he added. According to him, local content in broadcasting agencies doesn't need to be packed in a show. But it can be inserted in other programs. "For example it wants to raise Betawi culinary and Betawi traditional clothes. It can be inserted in news program or talk show," he conveyed. Meanwhile, ANTV Chief Human Resources, Risya Maharmilla stated, her side has aired many contents. But, her side promised to improve local content both for its portion and quality.